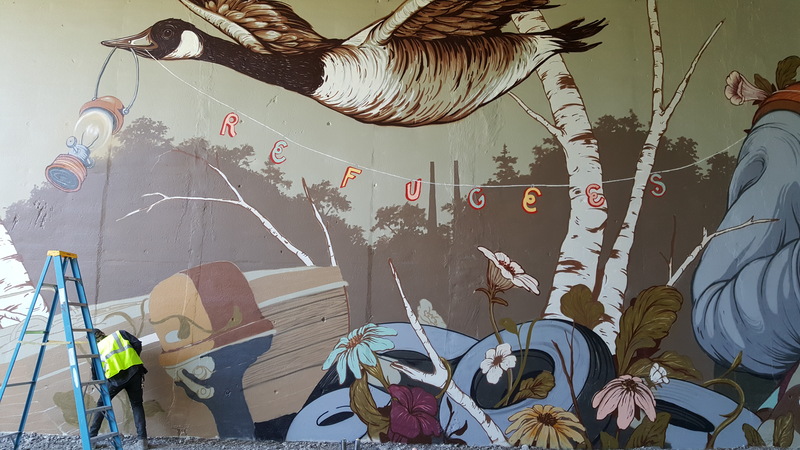 Refugees Welcome, by Pat Perry. Photos by Michael Gill, assembled by Brittany Mariel Hudak. The vast majority of the murals recently painted along the Red Line between the Airport and Tower City are completely devoid of politics. That’s remarkable, especially as the city prepares for the Republican National Convention. 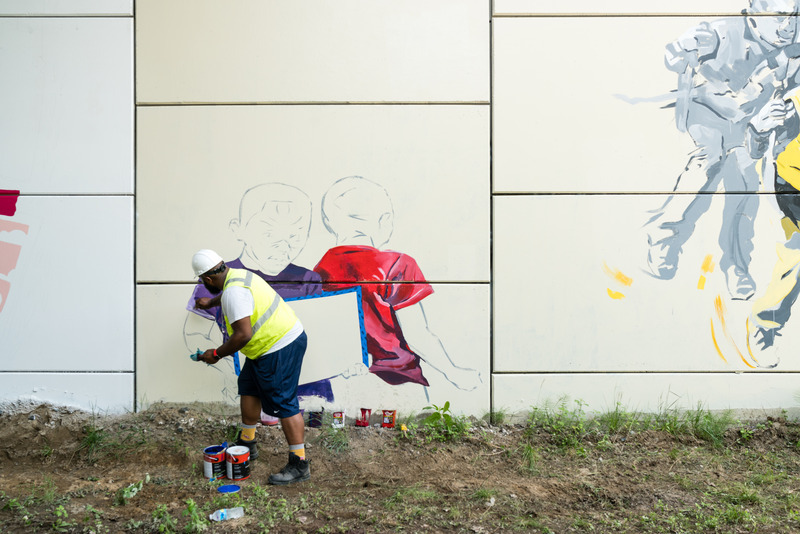 With broad support from the Cleveland Foundation and several public entities, and with board approvals required even before the artists’ names were released (let alone before they started painting), the murals of LAND Studios Inter-Urban project were meant to celebrate the Anisfield-Wolf Book Awards, and brighten the journey along the tracks. Many are completely abstract. Several others are simply decorative, or offer general, positive messages. None are any less beautiful for not picking fights. Louise Chen. Photo by Michael Gill. It’s important to note that none of these murals are “graffiti” in any sense. They are commissioned, created with permission, funding, and plenty of official support. Indeed, if they were illegal, every one of them—no matter how innocuous—would have been a political act: a statement about property ownership, or free speech, or the nature of crime, or however you want to cast it. That’s how real graffiti is, and this is not that. The most exciting and relevant of these, though, are charged with locally relevant ideas—the kind that shouldn’t be politicized, but which in the current climate have become exactly that. Indeed, these are the ones that clearly reflect the project’s stated theme—which as we noted (here in the Summer issue of CAN) is to find inspiration in works of literature celebrated by the Anisfield Wolf Book Awards—a prize once described by NPR as “The Black Pulitzer.” Those are works “that have made important contributions to our understanding of racism and our appreciation of the rich diversity of human cultures.” I’m thinking of two murals in particular, painted by Rust Belt artists who know a lot about their context. The artists use what they know beautifully to illuminate the situation in Cleveland. They are less journalistic, but have something in common with Kate Sopko’s series of short films, The Fixers. First, I’m thinking of Pat Perry’s mural near the West 25th Street rapid station. It’s absolutely enchanting, like a page from a book for children. Flowing lines, subtle shading and highlights, a gently coordinated color palate of beiges, olives, and browns make an image of a woman quilting, flanked by Canada geese, and at the lower left a small boat with an outboard motor. There are birch trees and flowers. And stretched along the thread the woman is using to sew, two words: Refugees Welcome. Nice, right? But as comfortable as it is to look at, the details of the piece resonate profoundly. Maybe this woman arrived on a small boat. Maybe she will find a job sewing clothes, or even start a business doing repairs and alterations, or custom suits and dresses. Somehow, she will become part of American society. The quilt in the image calls to mind the patchwork of cultures that make our country strong. The geese are beautiful, and they can’t help but call to mind migration. Anyone who lives along their routes knows that different people see them differently. Some simply see them as beautiful birds, and hear their squawk as a timeless sign of the turning seasons. To others, they are a nuissance: they hang out in parks and frighten the locals. Of course they have to poop somewhere. And cities sometimes respond literally by calling out the dogs, hiring companies with trained animals to drive the geese away from the parks. That’s probably how it feels to live like a refugee. Pat Perry at work. Photo by Michael Gill. But Perry’s mural declares them welcome. It should be a point of pride for Cleveland to proffer this hospitable message. Perry is from Detroit, a city much larger, but very much like Cleveland in that both have welcomed refugees to help repopulate hollowed out neighborhoods. A low cost of living offers them opportunity to get a start. “These people are my neighbors,” Perry said. The unmistakeable skill in the execution of the piece is all the more remarkable if you know just a little bit more: Perry was not in the original lineup of artists chosen for the project. 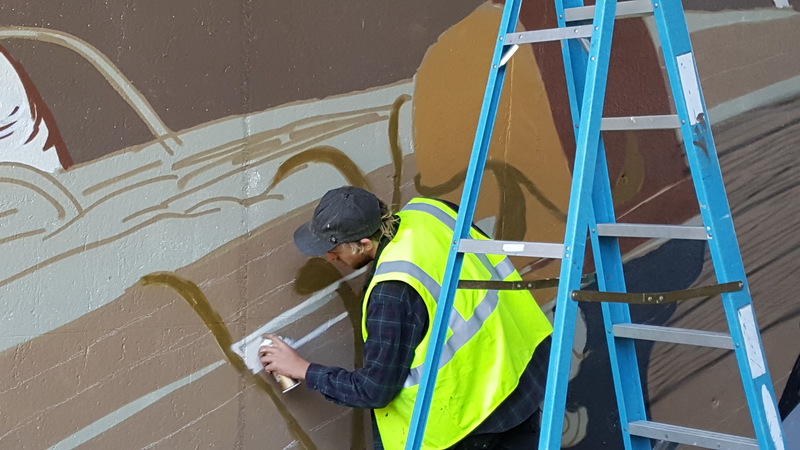 But when another artist had to drop out due to a family emergency, he got the call from Inter Urban mural curator Jasper Wong. 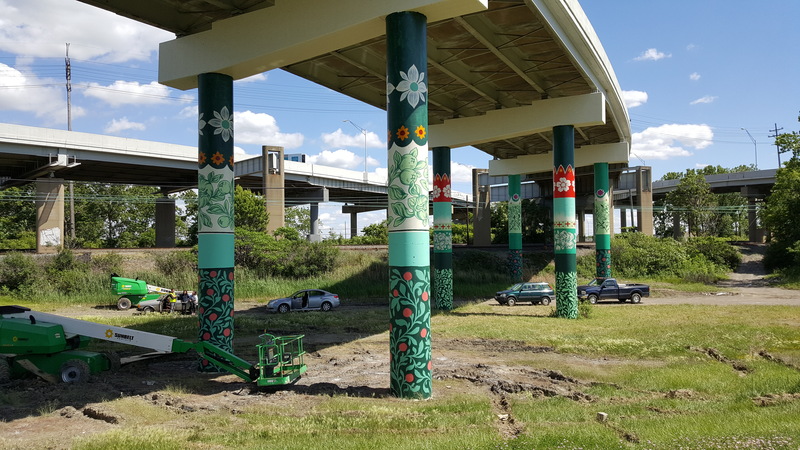 It was a Friday afternoon, and due to RTA scheduling concerns, the mural had to be conceived and completed in less than two weeks. Could he pull that off? He drove to Cleveland that night. 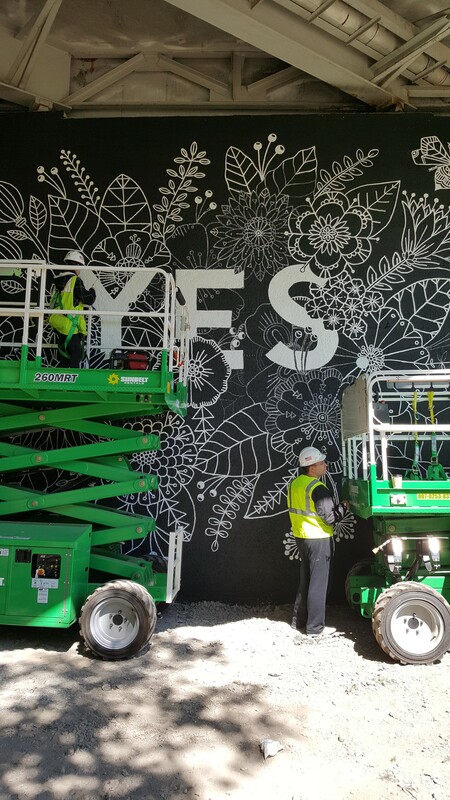 He primed the wall on Saturday, and by Wednesday had largely completed one of the most elaborate murals on the line. 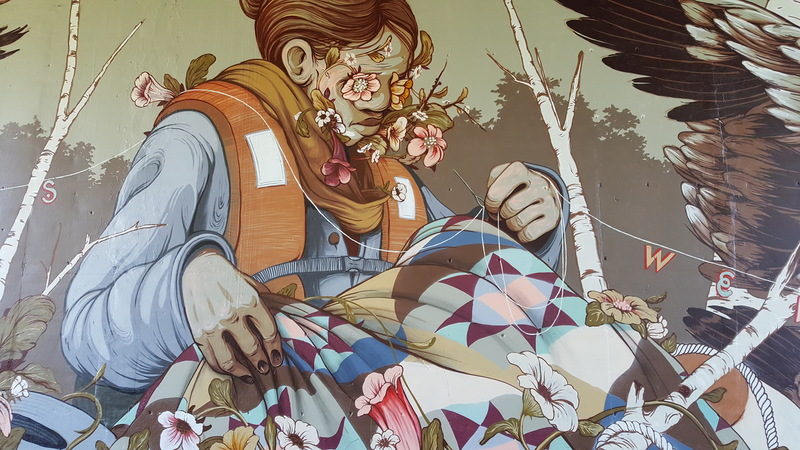 The second mural managing this kind of depth is by Cleveland artist Darius Steward, whose work we know from exhibits all over town, including at the former William Busta Gallery, but more recently at Maria Neil Art Project. Last weekend he was part of the Artists Village, helping to commemorate the centennial of the Cleveland Museum of Art. Darius Steward at work. Brandon Shigeta photo courtesy of LAND Studio. His work downtown along the Red Line carries on the imagery and themes he has painted in his gallery shows. There are images of Black boys dangling on swings. Steward sees these kids as going nowhere, lolling away the time – tick, tock, tick—at the bottom of a pendulum’s arc. You can read that for the individual, but also as a statement of racial progress: there seems to be activity—you can see the movement—but the kids are dangling in place, not moving forward. Steward’s skill in handling paint on paper or canvas – little puddles of watercolor forming highlights of a cheekbone, or in the wrinkle of a shirt, for example—show clearly in the large and vertical wall. It’s not the same kind of play, exactly, but his brush work here does have the same effect. Steward says technical skill, though, is only a means to an end . . . and the end is communication. Steward and Perry’s works both do outstanding service to riders of the Red Line, and to the whole inter-Urban project, and especially its partner, the Anisfield Wolf Book Awards. Cleveland is a diverse place, and our success depends on having an everybody-in mentality. Here’s hoping our National Politics evolves that way.